In between writing novels falls a lot of rain, hail and sleet. And that is something given the temperature in Thailand rarely drops below 20C. I spent time with the crew of Do You Believe in Love, a documentary about – you guessed it – love, interviewing an expat couple (French) about the meaning of love in 2007. Tomorrow is another interview with a German woman who had been married to a Thai. I will be finding out what goes on when love comes to an end in Thailand. Also I put the wraps on a draft of a non-fiction project. The first draft is done. I use the term “done” with extreme caution has a first draft is hardly a finished book. It is the start along the path of a finished books. The path includes three more drafts (and numerous mini-drafts within each major rewrite. Then come outside reader comments and copyeditors and proof readers. It is a miracle at a book is ever produced. On April 28th I will go to Chiang Mai and give a talk about the Risk of Infidelity Index, and need to get hotel and plane bookings. Then there is a wedding of a friend in Penang in mid-April to attend. I must get that trip booked as well. “While the rest of Asia seems to be moving faster and faster, Thailand wants to wrap itself up against foreigners. Do you think an ambitious executive now thinks that a few years in Thailand will brighten up their resumé, or will they go to China or Vietnam?” says Anthony Ainsworth of headhunters Richard Glynn. “This is the worst time for foreigners in recent memory. Thais have every right to turn away ruffians, but the people in charge now don’t seem to understand that without foreign knowhow this country is going to have a very hard time,” says the bank chief. Meanwhile, Calvino continues to kickback and wait for a new case to come through the door. Congrats to Stephen Leather whose novel Cold Kill has made the shortlist for this year’s Thriller Awards. The short list was announced yesterday during the first International Thriller Writers’ Brunch and Bullets luncheon. The winners will be announced at the Grand Hyatt Hotel in New York City during Thrillerfest, to be held there in mid-July. As many of you know Stephen spends a large part of each year in Bangkok and is the author of the best selling novel Private Dancer. You can pick up a copy of Private Dancer in English and now in French at most bookstores in Thailand. And by all means buy a copy of Cold Kill. On Sunday 18th March 2007, Mark Schreiber’s review of The Risk of Infidelity Index appeared in The Japan Times. A review in a major international newspaper like The Japan Time needs to be put in perspective. With fewer newspapers around the world are running book reviews. Those with review pages are cutting back on the number of reviews. I understand that The Japan Times is also cutting down on the number and length of reviews. Less space, fewer newspapers with book review pages is coming at a time when the number of books published each year reaching 175,000 in the United States alone. Access to review space has become more restricted. But we haven’t seen anything yet. Some have said this reflects the failure of publishers to advertise in newspapers. Others say there are fewer people who are interested in reading a book review. The combination of these forces point to a future where book reviews such as the one above will become increasingly rare. In the future, I suspect reviewers will migrate to the Internet. That is not all bad as certain specialized website are reviewing fiction with intelligence and depth, bringing books to a larger audience. A good example for crime fiction lovers is Material Witness which also reviewed The Risk of Infidelity Index. There will be fewer professional reviewers like Mark Schreiber who has a lifetime of study of books in Asia. And there will be more of the amazon.com reader reviews. Not to knock those reviewers, many of them know their stuff and write insightful, and provocative reviews. But it is an eyeball issue. If you find your way to an amazon.com review, it is because you’re already interested in a book and want to check out what other readers have to say. If you’ve never heard of The Risk of Infidelity Index (which isn’t available through amazon.com) then its existence will never register on your book radar screen. I’d like to recommend this illustrated memoir by Sam Sotha. On April 17, 1975 Sam Sotha and his wife Sony, along with thousands of others, were forced by the Khmer Rouge to leave Phnom Penh. Shot, tortured, starved was the fate of many Cambodians during the Khmer Rouge years. Millions died. Sam Sotha’s diary and drawings record their four-year journey through the killing fields. This highly moving personal story describes Sam's and Sony's ordeal and how during the course of their struggle, they found strength in their Christian faith. As they crossed Cambodia from one prison camp to another, the spiritual bond strengthened between husband and wife. That bond guided Sam and Sony through the darkest moments, when it seemed only a miracle could save them from certain death. The hand drawn illustrations from the days when Sam and his family were in a refugee camp along the Thai-Khmer border is worth the cost of the book. Next Week I will fly to Phnom Penh for the launch of the book. 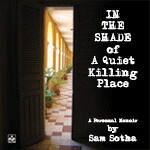 In the Shade of A Quiet Killing Place cost $19.95 plus shipping.